Product prices and availability are accurate as of 2019-04-20 19:10:40 UTC and are subject to change. Any price and availability information displayed on http://www.amazon.com/ at the time of purchase will apply to the purchase of this product. The aluminum 3003 continuous hinge has countersunk holes and is suitable for surface-mounted applications requiring uninterrupted support along the full length of the pieces being joined. 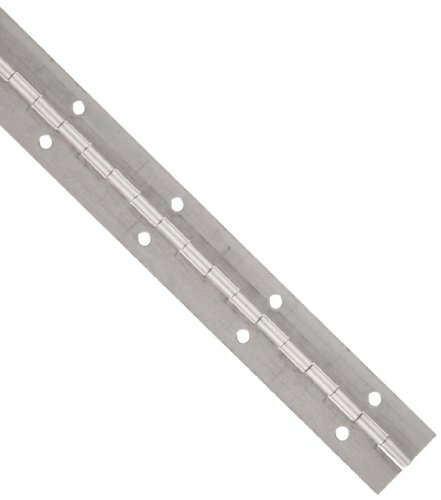 This hinge is suitable for hollow metal doors and frames, and for use with wood and aluminum. Aluminum 3003 is lightweight, weldable, and more corrosion resistant than steel. However, aluminum 3003 does not provide the same strength as aluminum 5052, stainless steel, or steel and is less corrosion resistant than aluminum 5052. Since the hinge is unfinished, it is suited for applications that will not be exposed to corrosive environments. The range of motion for this hinge is 270 degrees from the folded position.